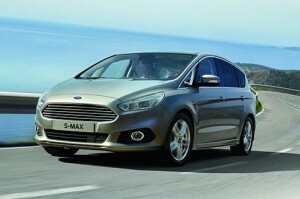 This all new S-Max has all the credentials of the old one, space for seven and fun to drive. There’s just as much room inside as there was before, you can fit three adults and more importantly three child car seats in the second row of seats and while the third row is ideal for children you can squeeze an adult or two in for a short journey. There are loads of cubbies and storage bins dotted around the cabin, and those in the rearmost seats even get a pair of cupholders to make longer journeys less painful for small kids. 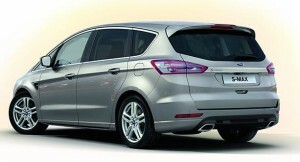 Bootspace is decent, with all seven seats in place there is 285 litres of spaces which is more than a Fiesta. The S-Max has a single trim line this quarter, Titanium. All cars get Ford’s new SYNC infotainment system and 17-inch alloy wheels, as well as parking sensors, keyless go and a DAB radio, sat-nav and USB connectivity. For a whopping £2,200 extra you can add the Titanium X pack, with LED headlights and electrically operated heated leather seats. The new Ecoblue 2.0 litre diesel is the only diesel choice, avaialble with 150 or 190bhp output, The 150 bhp is perfectly suited for moving the car along and can hit 62 mph in a none too shabby 10.8 seconds form standstill. The 190bhp version has 400nm of torque so if you want to pull a caravan this is the option for you. The 1.5 litre petrol is powerful, 163bhp, but thirsty so only a realistic option for very low mileage drivers, we would be surprised if you achieved 30 mpg.